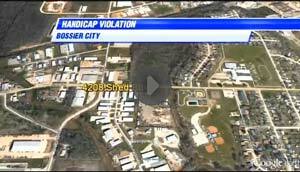 BOSSIER CITY, LA (KSLA) – One of Bossier City’s three public pools is not in compliance with the American with Disabilities Act. Now, city leaders may have to dig deep into their pockets to reopen the pool in May. According to Bossier City Attorney Jimmy Hall, even though the Shed Road pool house otherwise referred to as “Meadowview pool”, has a handicap lift for the pool, the spaces inside the pool house itself aren’t wide enough for wheelchairs. The issue was brought to light when this summer, a grandpa couldn’t get around inside the pool house to help his grandchild. It’s a problem community member Jojo Sutis can understand, “I can totally see someone needing the handicap accessibility wanting that to be available,” she said.